Check out our music streaming service, which features full-length recordings of live concerts, and other content! Sreevidhya Chandramouli performed the veena in Frisco, under the banner of IGMAA. She was accompanied by Poovalur Sriji on the mridangam, and Balaji Chandran on the ghatam. ​​​A vina concert by Sreevidhya & Narayanan Chandramouli, accompanied by Shubha Chandramouli (mridangam), and Dr. Ravi Balasubramanian (ghatam). ​This concert featured Sreevidhya Chandramouli (Vocal), Archana Srikanth (Vocal Support), Raman Iyer (Violin), Nirmal Narayan (Mridangam), and Kapila and Sushruta Chandramouli (Thambura). 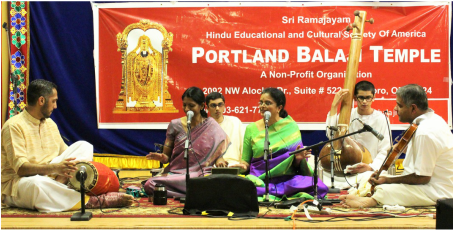 ​Sreevidhya Chandramouli (vocal), Raman Iyer (violin), and Nirmal Narayan (mridangam) performed in Seattle. See the video below. Sreevidhya Chandramouli (Veena) and Poovalur Sriji (Mridangam) performed at the Library of Congress in Washington DC. See the video and more information by clicking on the right or here. ​Sreevidhya Chandramouli (Veena) and Poovalur Sriji (Mridangam) performed at the Kennedy Center in Washington DC. See the video by clicking on the left, or here. ​Click here to listen to a radio broadcast of Sreevidhya Chandramouli on the Veena.